Easy to assemble, even for 60-year-old woman it looks amazing I am so happy that I ended up buying this one I love it.I was going to paint the legs are different, but I decided to hold off for a while it's great for my storage of my job I will be buying more.I think this is much nicer than the cubes on the floor. So let me start by saying, I was not a fan of the instructions. They could have been written much better and less confusing. But, I do love the end result. 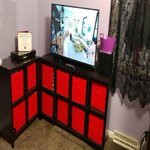 After mounting our tv, our old "tv stand" ended up turning into an over flow area for toys and the 2 drawers were left as junk drawers. I wanted to replace it with a peice of furniture that was going to be 100% utilized and not feel like it's a waste of space. My daughter is 2 and we have a baby on the way. 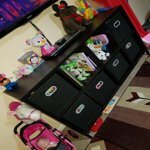 With toys everywhere and no space for a toy box this was the PERFECT peice of furniture that allows us to store all my daughters stuff while keeping the living area looking nice. 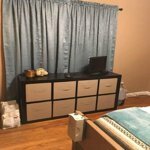 The cubbies will fit 12×12 foldable storage cubes. I love that this comes on a metal frame to lift it off the ground. This allows for us to hide a surge protector safely out of the way. The color is great. The espresso is very dark and cool it's not a warm red color like I see a lot listed under that name. Just what I was looking for. Good quality for the price - and FREE SHIPPING!! I wanted a more polished look, so found some baskets from Ikea that fit perfectly. Very happy. There is a similar product without legs that I accidentally ordered initially and returned - it appeared to be much lower quality. My husband states it was easy to put together. Perfect size for wall space where it was placed. Love the size of cubes, large photo albums fit nicely. Would suggest that dementions of cubes be in product description. Could not find them. Made an estimated guess that worked, would have beeb nice to not have to guess. Wow these look AMAZING!!!! 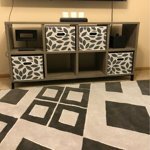 This one was super easy to put together, i also bought the 9 cube organizer too which took us about 2 hours to put together. Regardless of if it took 20 minutes or 2 hours its worth it!!!! Love love loveeeeee these! 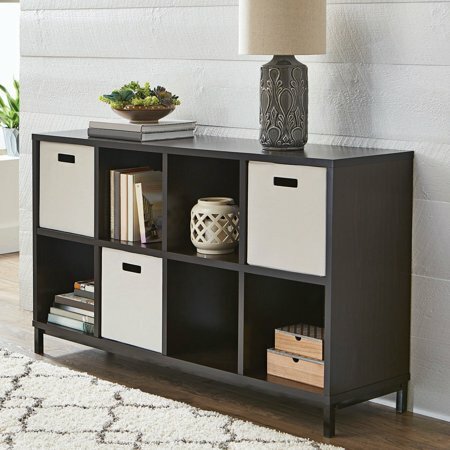 Awesome lookin storage for the right price! Easy assembly. Took about 2 hours to assemble all by myself. For the price, you can't go wrong. Using it to store my record collection and it's just perfect! 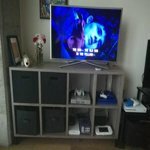 My husband and I are gamers and we have more than 2 video game consoles. THIS saved our lives! It's enough for a 60-inch tv and more. It's amazing. Not to mention, it matches with the industrial aesthetic I am going for. Will be buying another one soon. Though, we have to return it the first time because it has a HUGE punch hole on one piece of wood. "Shipping". The customer service was great. The return and refund time (one click reorder without paying for the new item and no payment needed for shipping) was swift and easy.